The Valve Interlocking keys must be stored in a safe and controlled environment on site. 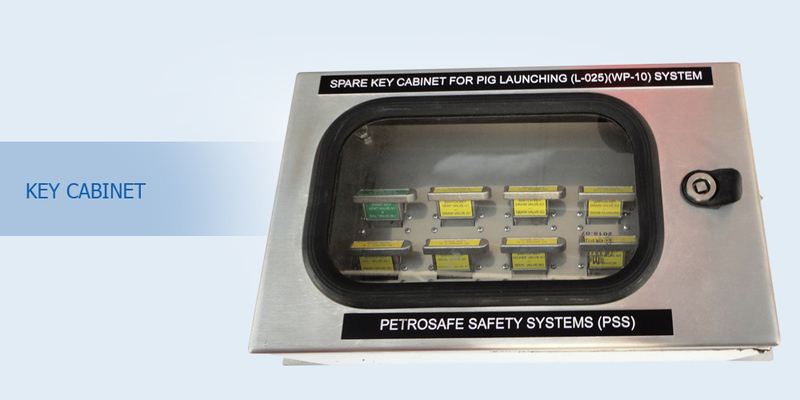 The PSS Key Cabinet has been designed especially for this purpose to ensure enhanced control and management of the Valve Interlocking keys. Fire Proof transparent Glass Door for Full Visibility of the Keys. Custom built and with Lock & Key. Tamper proof Lock to avoid Sand, dirt, water Resistant. The Key Cabinet is used to keep the initiating and final keys of a locking sequence in a safe place. The Key Cabinet is manufactured with dedicated key coded positions for each key. Every key position has a tag plate that indicates whether that particular valve or system is in operation or spare or maintenance. The cabinet key positions are identical to the keys of each particular lock/system;this ensures that there is no possibility to insert a key in the wrong position by the operator. The key is visible through a transparent glass. The area of the transparent door has been maximized so that all key tag plates are in visual range. The Key Cabinet can be supplied with a block diagram, which shows all sequences. The door is fitted with a lock to close the Key Cabinet to avoid unauthorised access. The cabinet can be easily mounted on the wall in control room.